Thursday, December 4, 1913: Ditto. One of the things that I really enjoy about blogging is how I occasionally get comments from wonderful people who knew my Grandma or other relatives. It is awesome to learn more about family members and what they were like. I tingled with excitement when I read Pat Lukas’s recent comment, and I’d like to thank Pat for sharing information that she had about Grandma’s little brother, Jim Muffly. Jim did some amazing things. Jim became a veterinarian with a practice in Lewisburg, Pennsylvania. I learned from Pat that he was also an inventor. 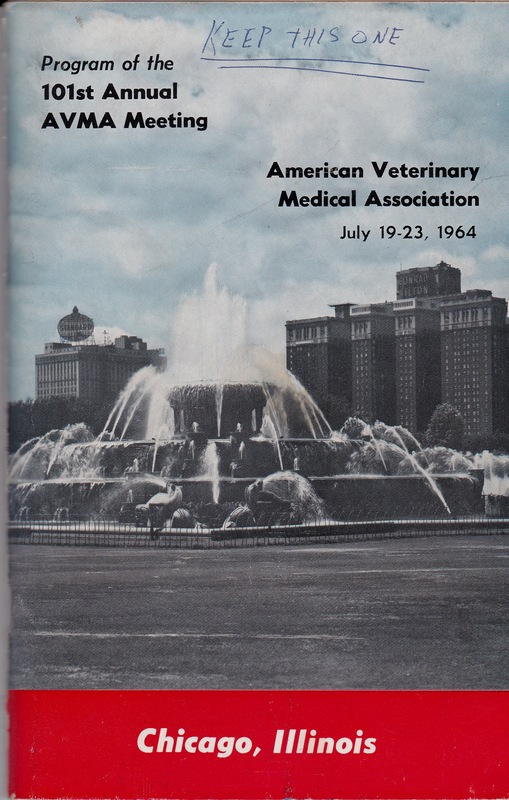 At this very moment I am looking at the “Program of the 101st Annual AVMA (American Veterinary Medical Association) Meeting” which took place in Chicago in July of 1964. James A. Muffly, V.M.D. 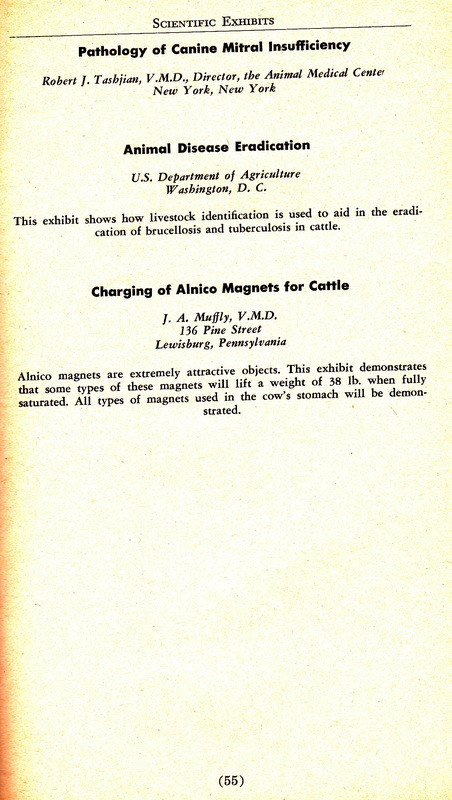 exhibited his invention for charging magnets which were used to remove metal, such as nails and bailing wire, from the stomachs of cattle. I remember Dr. Muffly. 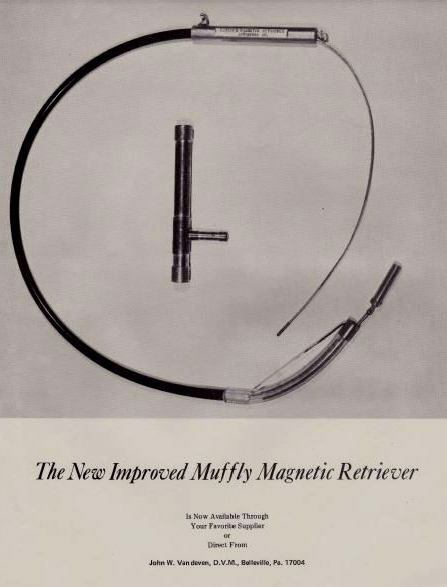 My father, John Vandeven, D.V.M., worked with him to develop the design for the Muffly Magnetic Retriever and helped him market it. I also remember seeing my father use the retriever on dairy cows. Pat was kind enough to share the cover of the 1964 American Veterinary Medical Association Meeting program and the page that describes Jim Muffly’s invention in the program, as well as a copy of an advertising flyer for the invention. In a herd of 55 Holstein cows, 13 were vomiting. Although hardware might have been ruled out because so many animals were affected, 7 lbs. of electric fence wire pieces and various other metal objects up to 5 inches in length were retrieved from 53 of these cows. My father considered Dr. Muffly a very good friend. The impression I carry of Dr. Muffly is that of a kind and gentle person. The information Pat gave me started a snowball that led to the discovery of Jim Muffly’s patent. My son Nathan was recently home over Thanksgiving and I mentioned the Muffly Magnetic Retriever to him. And, within minutes he’d found Jim Muffly’s 1956 patent for the instrument that could be used to remove metal from cows stomachs. The tool Jim Muffly developed was flexible and could be maneuvered into the cow’s stomach. Nathan also found where Jim Muffly’s invention had been cited in several more recent patent applications as a basis for those inventions—including several applications for inventions of human catheters. Thank you Pat and Nathan for all of the wonderful information. It’s fun to learn more about an awesome relative. What Ever Happened to Jimmie Muffly? Posted on December 4, 2013 November 19, 2015 by SherylPosted in GenealogyTagged family history, genealogy. How fun to hear stories like this from people who knew your family. Very cool, and a great invention. I am sure it was used in the farm country where I grew up. Isn’t that amazing?? I grew up across the highway from a dairy barn, but never had any idea there was something such as this. I love finding family patents! Especially the diagrams of the invention. Always great to hear from people who know more about our family. We had a goat who died from eating something. I don’t think it was metal but maybe one of these machines would have discovered it was. How great to have all these connections and contacts. And what an astonishing invention; I had no idea that cows ingested so much metal. Wow that’s amazing and very cool! Just amazing–your history detective-ing is bearing such fruit! How wonderful to learn more of your family history through your blog! Back then people had to take care of the animals themselves mostof the time. Interesting device – never heard of it though. What interesting connections. I do our family genealogy work. It’s fun to find things like that to link the past and present. As a physics teacher, we often had need for strong magnets. We found that cow magnets worked well for several of our demos. They are a more modern version. Thanks for the link. I bet that your students enjoyed your course. Your physics classes sound like fun. They were. Experience the phenomenon. It is amazing how connections are made (and information found) that never would have happened prior to the internet and other modern technology. That is so cool! Both the story of family history and the invention. Oh, my goodness, what an exciting discovery! What a great story – and a fascinating invention. Thanks for sharing. A fascinating story and interesting connections…At first I thought I had read the program wrong when it described a tool that could lift up to 38 lbs(!) of metal. Your uncle must have had a lot of grateful cows as well as farmers for this invention. That just made all my muscles curl at the thought of using that piece of equipment on poor cows. That said, if was all for the good of the cows, and what a phenomenal addition to the store of family history!!! To have an inventor in the family! Fabulous! what a wonderful entry I just love stories like this! This caught my attention this morning as I opened up my WordPress reader. This is an amazing blog if you are interested in the history of our country. Sheryl always adds interesting articles and information to her grandmothers diary entries from one hundred years ago to the day as she posts them on her blog. I have a story about this mind-boggling invention that she added to todays post. Watch for it in the next few days on my blog. Who would have thought? 🙂 Thanks for all the great information Sheryl! I’m honored that you think this post is worthy of reblogging. Thanks for letting me know. This is very cool – both that a reader was able to provide additional information about your great uncle AND that a family member who might not be interested in genealogy (but hopefully he is) is interested in finding out about a family member’s patent for you.